Fast food boulevard features food and restaurants taken straight from thr show, including Flaming Moes and Krustyburgers. 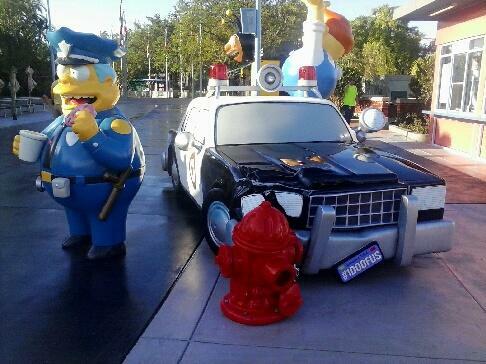 The new area will feature more shops, more food and even more Simpsons fun and photo ops. 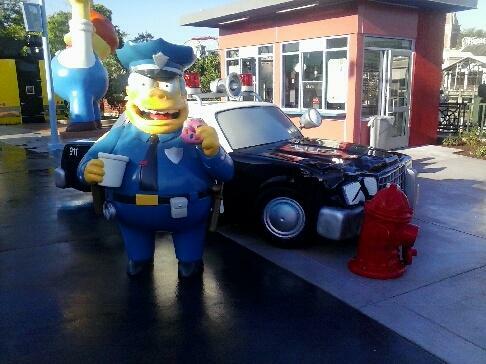 Chief Wiggum stands in front of his police car that he ran into a fire hydrant while trying to get a donut from Lard Lad Donuts. 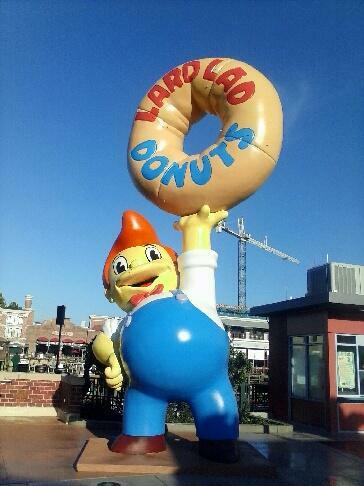 Lard Lad himself greets guests with a huge donut in front of the Lard Lad shop. You can actually purchase a huge donut from Lard Lad. 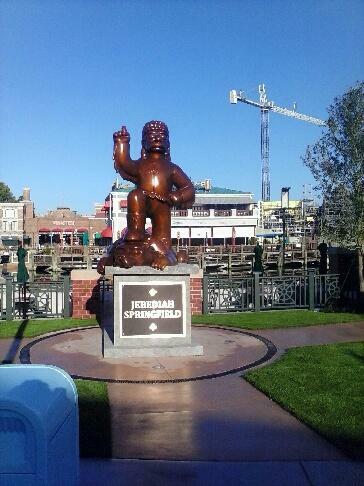 Jebediah Springfield stands in the center of the town that he founded after departing from Delaware. He overlooks the whole town and points towards the business Mecca, Krustyburger. 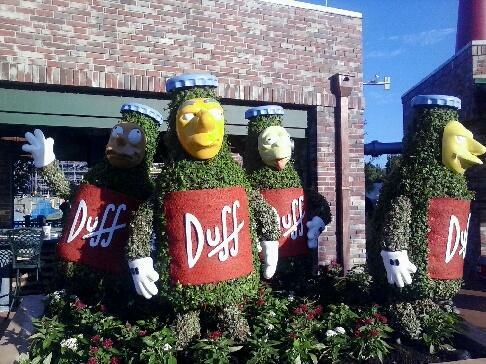 Next door you are greeted by Duff Gardens Topiary, including the all wise and all powerful Surly. Duff Gardens actually serves as a bar where guests can get delucious Duff Beer, the official beer from The Simpsons. 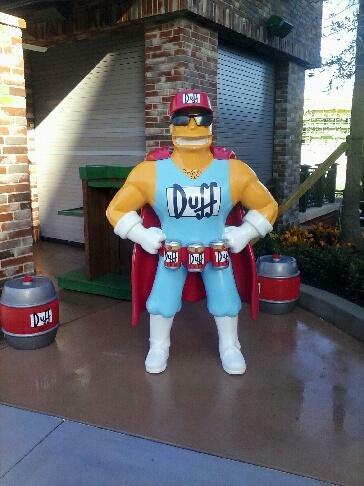 Proud mascot of Duff Beer and the hero of hops and grains, Duffman stands ready to meet guests. 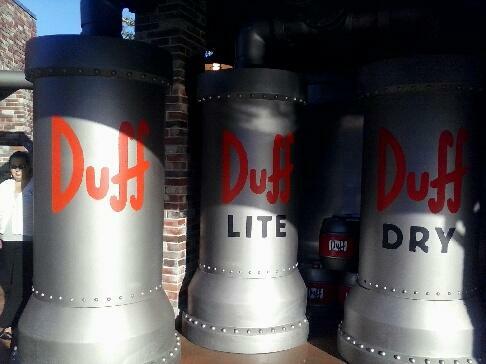 No stop in Duff Gardens is complete without a visit to the Duff brewery. The area has huge vats of Duff beer freshly made! 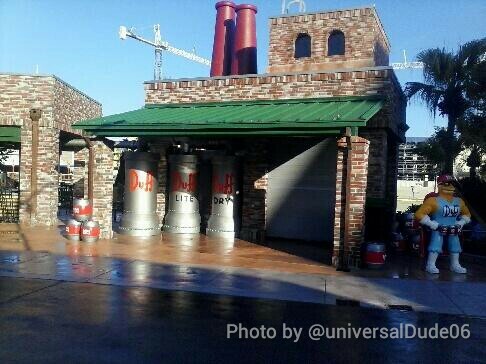 Duff Beer is made specifically and specially for Universal Orlando. It is a special recipe inspired by the show and only found at Universal. It is brewed by Florida Beer Company locally. The Duff brewery actually serves as a gift shop as well as a photo op. 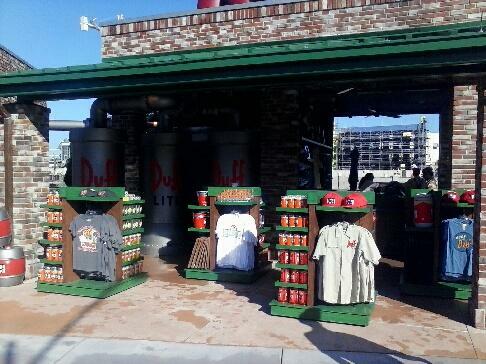 Guests can purchase Simpsons merchandise, as well as Duff brewery souvenirs. The food truck Cruise has not gone unnoticed by Universal Orlando. 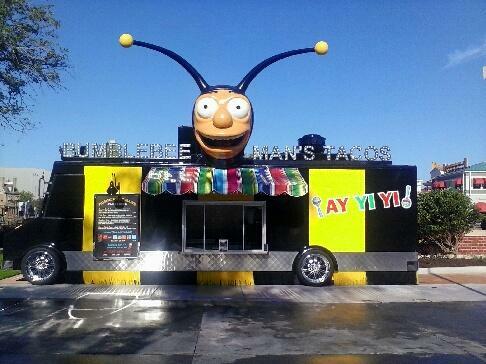 An all new restaurant is based around be popular character bumblebee man. Bumble bee man is a character on a Spanish speaking sitcom in the show. So what better way to represent him then for him to have his very own taco truck! While many of the shops in the area are not open, the area is open to the public and ready for photo ops. There is also an all-new flat ride fearome space aliens Kang and kodos.